WAIST HIGH: Arcadia To Re-Issue 1985's So Red The Rose. 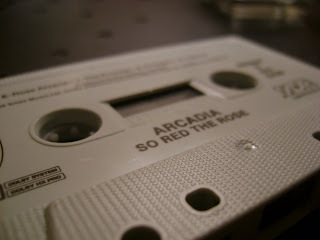 Arcadia To Re-Issue 1985's So Red The Rose. 25 years after its original release, Arcadia's So Red the Rose will be reissued in April in a 2CD/1DVD deluxe edition. The pack will include all 9 original songs, 7 bonus songs, a special CD featuring 12 rare tracks, and a DVD "which follows the filming of five music videos from the album So Red the Rose and the interesting combination of directors, locations, behind the scene footage & photographic montages (which will) come together to give a fascinating insight into the world of video production. The collection of videos including Arcadia's first single 'Election Day' are shown in full, including Dean Chamberlain's rarely seen interpretation of the song 'Missing.'" From duranduran.com: Arcadia were formed by three members of Duran Duran, Simon Le Bon, Nick Rhodes and Roger Taylor. They released one album So Red the Rose, which went Platinum, and reached #30 in the UK & #23 in the US. The album featured four singles, "Goodbye Is Forever," "The Promise," "The Flame," and UK/US Top 10 hit, "Election Day." The additional DVD was originally released on VHS in 1987. All Music Guide once described So Red the Rose as "the best album Duran never made."